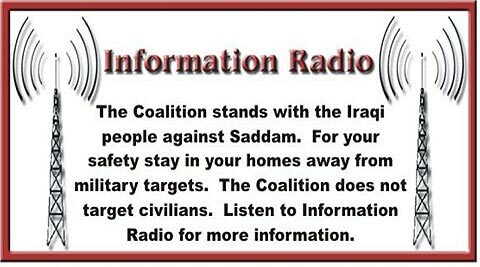 The first leaflets related to Information Radio were dropped on December 16, 2002, as part of Operation Southern Watch. 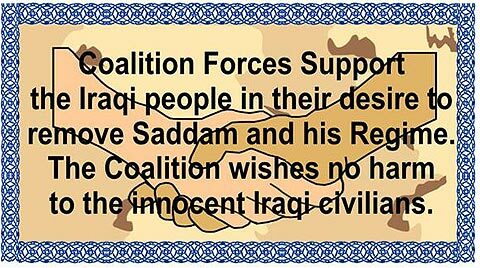 The leaflets referred Iraqis to radio frequencies where they could hear broadcasts by Coalition forces providing information. The first model was black and white, both sides identical. 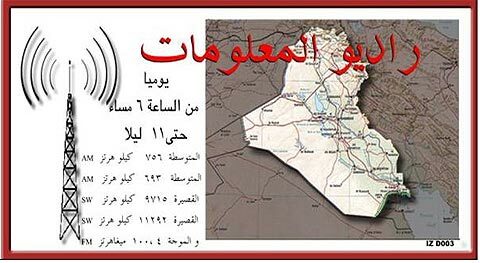 The same leaflets were dropped again on December 20, 21, 22, 23, 27 and 28, as well as on January 26, 30 and 31, February 6, 8, 12, 14, 23 and 27; and even on March 1, 6, 8 and 10. This indicates that old stock is used continuosly even though newer leaflets with updated schedules exist. Note: The real leaflets are slightly larger than pictured here. 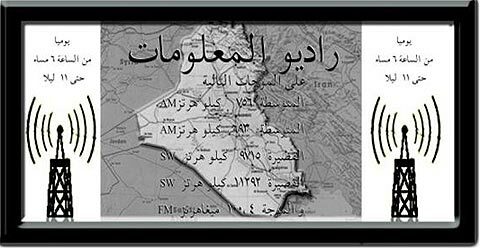 The 3-inch by 6-inch (roughly 7,50 x 15 cm) flyers are all in Arabic, and English versions are just translations that are never used in Iraq. 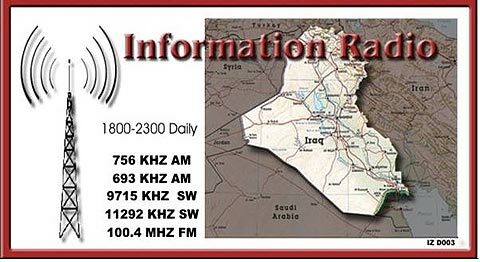 The second version of radio leaflets was printed in color, and first dropped in Iraq on January 2, 2003. Again both sides were identical. The same design was used in leaflet drops on January 4, 13, 18, 20, 24; February 14 and 28, as well as on March 4, 6, 8, 10, 11, 16, 17 and 21. This leaflet comes also as a slightly different version with a design number IZ D002 in the lower right corner. 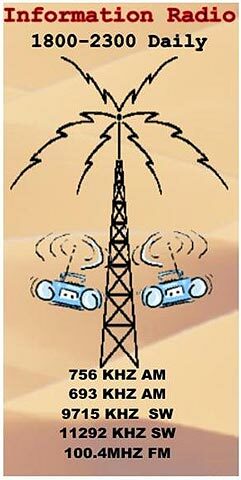 The third radio leaflet was essentially a colored version of the first with no new information. 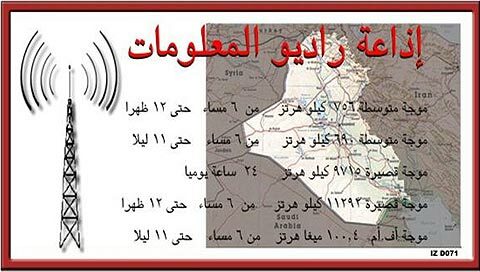 It was first dropped in Iraq on January 31, and later on February 14 and March 6, 8, 10, 16, 17 and 23. 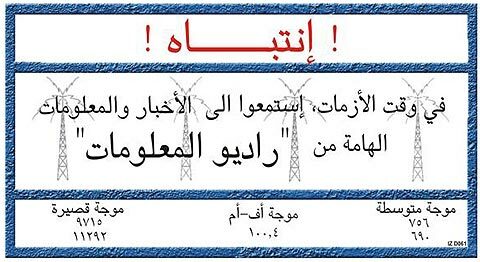 The previous leaflet was amended to include information on extended broadcasting hours and a message to civilians was printed in the back. The new leaflet was first dropped on March 1, and later on March 21. March 1 was the opening night also for another leaflet with a different design, listing frequencies on the other side and a message for civilians on the other. 693 kHz has been replaced by 690 kHz. 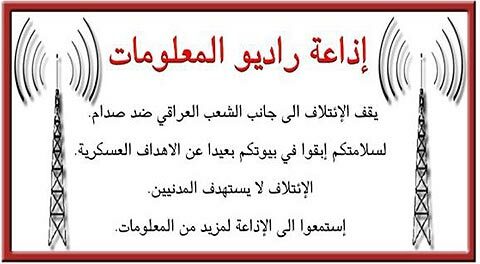 Since March 1, the following leaflet has been dropped also on March 23. On March 18, a new version of the very first radio leaflet was dropped for the first time with extended broadcasting hours on several frequencies, and again, 693 kHz replaced by 690 kHz. 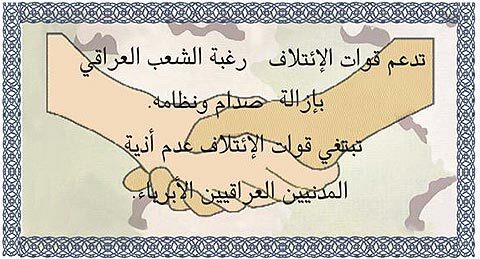 No Arabic-language original is available for this one. The same one was used on March 21. At the time of writing, US Central Command provided detailed information on leaflet drops only until March 23. It should be noted that schedules for Information Radio announced on the leaflets are different from what the Coalition has publicly announced. 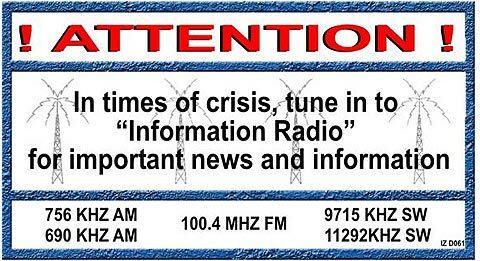 While even in the latest leaflets only 9715 kHz is said to be on the air 24 hours a day, a spokesperson has told that SOMS-Bs have been broadcasting on 756 kHz mediumwave and 11292 kHz shortwave for 24 hours a day from the start of the Information Radio campaign. Meanwhile, Coalition press briefings have seemed to imply that broadcasting is actually 24 hours a day on all of the five frequencies. However, neither the leaflets nor the briefings have mentioned the new frequencies of 4500 kHz and 101.4 MHz, but according to information received by DXing.info, leaflets with the latest frequencies do exist and have already been dropped.